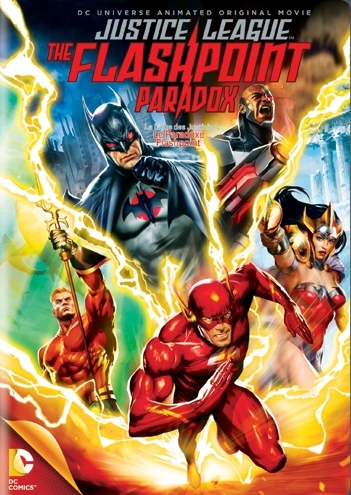 The correct answer would be Justice League: The Flashpoint Paradox. Barry Allen has grown up and still blames himself for a break-in that took his Mother’s life. So, when he gets the chance to pull a Quantum Leap of epic proportions, little does he know the consequences that await him. Alternate reality fans, take note: This is definitely the anti-origin story for superhero fans more than a little sick of all these reboots found in movie theaters and rental disks. This is the brilliant story of Geoff Johns and Andy Kubert, who crafted the storyline that became a crossover between a few comic book titles at the end of DC Comics’ long-running continuity (and just before The New 52). Barry awakes to realize he’s no longer The Flash and different versions of superheroes and supervillians fill this alternate reality. As the story unfolds, a simple threat by Professor Zoom proves to be the bind that unravels it all. Familiar characters are littered throughout this movie, including Batman, Superman, Aquaman, Cyborg and the Rogues (even Clayface and Black Manta make surprise appearances). While they all seem familiar, they all very act differently. Thomas Wayne is a high-roller who runs Wayne Casinos (and becomes a gun-wielding Batman). Cyborg is this universe’s ultimate hero (and also works for the NSA). Superman has been hidden away in a government lab for 30 years. And an ancient battle between Atlantis (led by Aquaman) and New Themyscira’s Amazons (led by Wonder Woman) has practically destroyed the entire planet. Unless Allen can recreate his initial speedster origins, there might not be anyone to prevent a doomsday device from destroying the worldwide population. With an estimated budget of $3.5 million, this movie is slick. While I totally dig the movie, I don’t necessarily like the new-style look of the old-school characters. They look like the roided-out baseball players of the ’90s. This is unfortunate and takes away from the suspension of disbelief. However, where the movie succeeds is with its talent. I love hearing some of the talented, original Voice Actors reprising their roles, including Kevin Conroy (the ONLY Batman voice, IMO), Nathan Fillion (Green Lantern), Dana Delaney (Lois Lane) and Dee Bradley Baker (Etrigan the Demon). Newcomers to the DC Universe include Cary Elwes (Aquaman), Steve Blum (Lex Luthor) and Jennifer Hale (Billy Batson). With the shout of “Shazam!” Captain Thunder appears and it’s a superhero Battle Royal. Almost feels like I’m playing Injustice: Gods Among Us video game. During the frantic climax, the animation is intense and incredible. Watching two speedsters battle is like watching equal gamers duel on Tron’s lightcycles. Because I don’t know all the stories of The Flash, I was immediately intrigued and I really enjoyed finding out these characters’ alternate storylines. there will be potential spin-off movies in the future. Speaking of future DC Entertainment-related products, a Sneak Peek at Justice League: Wars is also provided, which will be the first animated movie from The New 52. This will be the definitive All-New origin story for the Justice League — with new and “improved” versions of your favorite characters — to be released this winter. Not really looking forward to that one. Strength: Incredible Voice Actors and amazing alt-universe superhero story. Weakness: Superheroes don’t take PEDs. WTF Moment: An emaciated Superman looks more like the Elongated Man than the last son of Krypton.